Giorgio Michetti is the oldest YouTuber on the internet. And he’s on a mission. Giorgio Michetti was born in 1912 in Viareggio, in Tuscany, Italy. 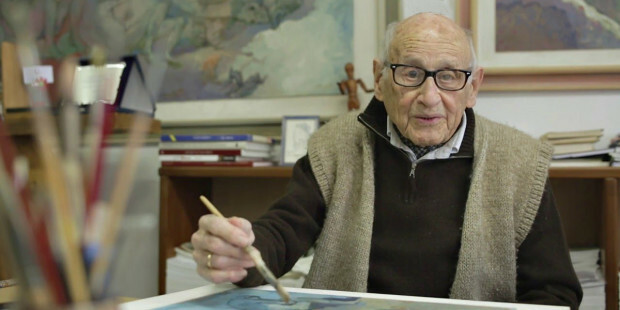 A well-known and respected artist (he’s been showing his artwork since 1929, and is a member of the Parisian Academia Arts-Sciences-Lettres) who has made more than 2,000 paintings while living all around the globe, from Switzerland to Missouri, he now also holds the record for being the oldest YouTuber on the internet. In an interview with the Spanish journal Semana, Michetti explained he started his own YouTube channel (he also enjoys doing some Facebook Live sessions periodically) after one of his students taught him how to use social media. “I’m just not the kind of person who simply sits on the couch. I need to keep my mind busy. I don’t understand a thing about computers, but I try to live the modern life: that is, a life in which you don’t understand anything!” he jokes. But even if, at first, the medium represented a bit of a challenge for him, Michetti has perfected his style to the point of giving master lectures on painting, history of art and aesthetic theory. His 65,000 YouTube subscribers and more than 10,000 fans on Facebook seem to confirm it. Enjoy Michetti’s lessons on “how to design without knowing how to design” and “the study of colors,” below. Who knows? Maybe you’ll learn a little Italian while being immersed in art!